Sorry for my absence. Part of it is that the Reds have frankly been rather hard to watch over the past month. But the issue is that my family and I are living in France for the semester. We arrived a few weeks ago, and are starting to find our way. I'm traveling with my university's students in their study abroad program. It's an amazing experience, but it definitely is hard to keep up on baseball when 7pm EST games start at 1am local time. In any case, I was listening to Effectively Wild today. Robert Arthur was on a few weeks back talking about his study that evaluated how the audio signature of the crack of the bat related to the result of the batted ball. It's great stuff. His principle finding was that the peak frequency (i.e. 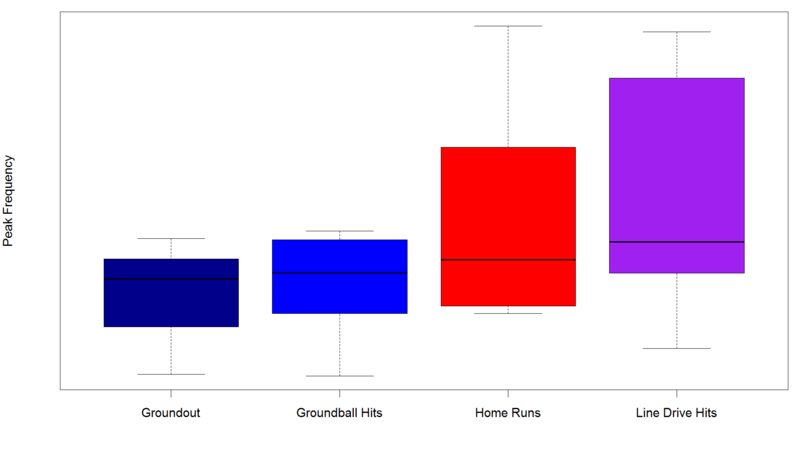 pitch) differed substantially between ground ball outs, ground ball hits, line drives, and home runs. Better-struck balls result in higher frequency sounds. That makes sense, because those sounds are the result of faster bat speed and more energy being put into the ball. It's really exciting stuff, and indicates that there's probably quite a lot to the claims that we hear from Baseball People about the sound of balls coming off bats. The potential applications of these data are really exciting. The most exciting thing is that these data could be used as another way to evaluate hitters. Bat crack data should be able to tell us some combination of how hard, and how squarely, batters are hitting balls. Only those with exceptional power should be able to achieve the highest pitch of bats cracking, once we controlled for bat type and (maybe) pitch type. Better hitters should have consistently higher pitch than poorer hitters. My guess is that pitch data should be less noisy than BABIP data, and so they might be useful when we're trying to make "Bonafide or Bonifacio" judgements. This could be used to evaluate pitchers as well. Are pitchers really inducing weaker contact? Or are hitters squaring up the ball well, but just hitting it to defenders unusually more often. The challenge is the data collection. MLB compressed games will help, but it's still a lot of data to gather, isolate, sort, and then analyze. Hopefully some young, enterprising people will go after this, as it has enormous potential.